Walk the mountaintop and touch the rock where the first Bantu kingdom stood a thousand years ago at Mapungubwe Hill. Guides will regale you with tales of gold artefacts and ancient civilizations. 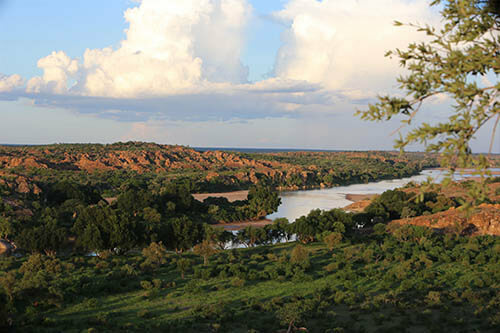 Mapungubwe Hill, “place of the jackal”, at the confluence of the Limpopo and Shashe Rivers, is a famous landmark in the area. This recently declared World Heritage Landscape was the capital of a sophisticated and powerful African Kingdom during the period 1220-1290 AD, the first in Southern Africa. It is believed that Mapungubwe was the forerunner to the Great Zimbabwe civilisation. It was on the top of Mapungubwe Hill where the royalty lived and were buried, while it is estimated that up to 5000 commoners lived in a large settlement at the foot of the hill. The landscape also includes the site where the first known Bantu settlement was established in South Africa in the 9th Century when the Zizho people migrated South from East Africa. Prior to that, the area was occupied by the San people, late stone age hunter gatherers and the Khoikhoi people, who were nomadic herders. Both these peoples left powerful legacies, mystical images in red and yellow ochres painted on to the rock shelters, enshrining their shamanic belief system. Archaeological excavations have yielded priceless gold and ivory artefacts. Items of Arab, Chinese, Indonesian and Indian origins believed to be the result of barter within the Indian Ocean trade network have also been identified. The most important and well-known artefact, the ‘Golden Rhino’, is on display in the Mapungubwe Interpretative Centre, along with other artefacts unearthed in the Mapungubwe World Heritage Site and the surrounding areas. More of the artefacts that were found here can be viewed at the University of Pretoria and some of the clay sculptures from the area can be seen at the Cultural History Museum in Pretoria. Mopane Bush Lodge organises visits to Mapungubwe Hill, where one can experience the mystery of the Kingdom and revel in the beauty of this new park; in addition, visit the Mapungubwe Interpretive Centre to gain more knowledge of and view the artefacts of the fascinating history of this area.